First of all, we want to thank each and every author who participated in our contest this year. This was our inaugural contest, and we received an overwhelming response and many truly wonderful stories. The genres and themes ranged in subject from historical to far future, from hard science fiction to fantasy, from magical realism to stream-of-consciousness, and many more. The ideas crossed the globe and the cosmos, and competition was fierce. ​Anushka Brito - "In the Moment"
Barbara Buckley Ristine - "History Lessons"
Cynthia C. Scott - "Ruby's Paradox"
Jens Hieber - "Gather Some Stars"
Mae Baum - "The Scentless Man"
Michael Harshbarger - "George and Marcus in Transit"
Seth S. Marlin - "The World Is No Different"
Stephanie Miraglia - "Face to Face"
"Ruby's Paradox" is a story that spans nearly a century of U.S. history, from Southern sharecropping in the 1930s to the election results of 2008. The narrative grabs the reader from the first few lines and takes them on a trip back and forth between the modern day and the past, touching on nearly every decade in between. 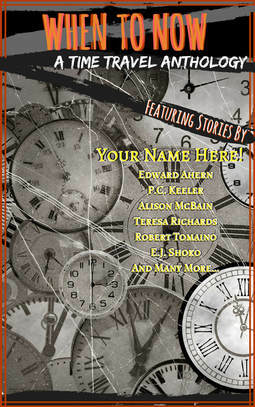 It's a truly powerful story about choices and consequences, and the editors of the Fairfield Scribes are thrilled to include it as the feature story in When to Now: A Time Travel Anthology. ​Cynthia C. Scott has been a writer ever since she was a teenager and doesn't recall a time when she didn't want to write. Her work has appeared in Glint Literary Journal, Copperfield Review, Flyleaf Journal, Graze Magazine, Strange Horizons, and others. She has a Creative Writing degree from San Francisco State University. She still lives in her hometown of Richmond, CA. with six cats and books. Currently she is a book reviewer for the website Bookbrowse.com. We will be sending out personalized feedback within the next 24 hours to each and every entrant, so look out for an email from fairfield.scribes@gmail.com. If you entered the contest and haven't received an email from us by Monday, June 4th, after checking your spam folder, please contact us and we will get back to you ASAP. During the submission process, at least one acknowledgement email bounced back to us because of an author's full mailbox, so we want to make sure that our communications can reach every entrant. Thank you again to everyone who participated in our contest. We were honored to read your stories. From the first popularization of the genre with H.G. Wells' The Time Machine, to cult books such as Slaughterhouse-Five and A Wrinkle in Time, time travel has long fascinated readers of science fiction and fantasy. The premise can be absurd, such as The Restaurant at the End of the Universe, or filled with adventure, like The Chronicles of Narnia. Characters can have a love story over the ages, such as The Time Traveler's Wife or travel far into a dystopian future, like Planet of the Apes. Regardless of style, time travel is a compelling sub-genre of science fiction and fantasy. To jump on board the time travel train, the Fairfield Scribes are releasing When to Now: A Time Travel Anthology, and we're looking for our feature story. Submissions are open between now and May 1st, 2018. Original stories only, please – no reprints will be accepted. Simultaneous submissions are fine, but please let us know immediately if your story is accepted for publication elsewhere. Word length can be between 2,000-10,000 words, which includes the possibility of a flash series of 2-4 pieces (as long as the total word count for all pieces together is between 2,000-4,000 words and the stories are all related in some way). The winning story will be featured in the collection, and the winner will receive both an electronic and hard copy of the anthology. The author will also be promoted on our website, and invited to participate in any reading events that will be scheduled (located in the Connecticut/New York area). The Fairfield Scribes asks for first publication rights of the winning story for print and eBook; all other rights remain with the author. We will respond to every submission we receive within a couple days to let you know we received it – if you don't hear from us within 5 days, please email us again, as that means your submission was lost. We will also offer personalized feedback on each submission. The winner will be announced on our website on June 1st, 2018, and the anthology will be released on October 1st. Limit 1 entry per writer. Please follow William Shunn's guide to formatting stories and send all entries in .doc, .docx or .rtf format to: fairfield.scribes@gmail.com. In the subject line, write "Time Travel Anthology." Include a link to your website, if you have one, and a short writing bio – if you don't have either, don't worry. It won't affect your chances in the contest. If you're looking for more info on what we publish, check out our previous anthology, Z: Tales from the Zombieverse or any of our individual writing in our Scriptorium. If you have any questions about the contest not answered in these guidelines, please email us at: fairfield.scribes@gmail.com and we'll get back to you as soon as possible. Thank you, and Bon Voyage! ​We want to thank everyone who submitted to our feature story contest! We received some really amazing entries, and we're looking forward to reading them all. Everyone who entered our contest will receive personalized feedback on their stories from at least two editors of the Fairfield Scribes. The winner of the contest will be announced here on June 1st, 2018. If you're biting your nails in the interim and are looking for advice on other writing projects, we've compiled a great list of resources from around the web. While waiting for the results to our contest, we encourage you to check out our list of tips HERE, and to keep writing and submitting.